With the 48-hour countdown proceeding smoothly, things are getting set for the lift-off of the Polar Satellite Launch Vehicle (PSLV- C14) from the spaceport at Sriharikota at 11.51 a.m. on Wednesday, September 23. The PSLV- C14 will put India’s Oceansat-2 and six nano satellites from abroad in orbit.“Everything is okay so far. Things are working as per plan,” said M.Y.S. Prasad, Range Operations Director for the mission. “We started the countdown at 9 a.m. on Monday. We keep a couple of hours as reserve,” he explained. The filling of the liquid fuel in the rocket’s fourth stage had been completed. The second stage would be filled with liquid fuel beginning from Tuesday evening, said Dr. Prasad, who is also the Associate Director of the Satish Dhawan Space Centre, Sriharikota. S. Satish, ISRO spokesman, said: “The weather is benign. The countdown operations are progressing satisfactorily. The launch will take place between 11.51 a.m. and 12.06 p.m. on Wednesday.” The PSLV is a four-stage vehicle with liquid fuel in its second and fourth stages. Solid fuel propels its first and third stages. It is a core-alone version of the PSLV that will put Oceansat-2 and six nano satellites in orbit. The core-alone vehicle does not have the six booster rockets that are strapped to the first stage in the standard version. The four stages of the 44-metre tall PSLV-C14, weighing 230 tonnes, were stacked up in a gigantic structure called the Mobile Service Tower (MST) in the first launch pad on the shores of the Bay of Bengal at Sriharikota. A few hours before the rocket’s ignition, the MST, which weighs 3,200 tonnes, will roll slowly to its parking place on 32 wheels, eight in each corner, on a twin rail-track. 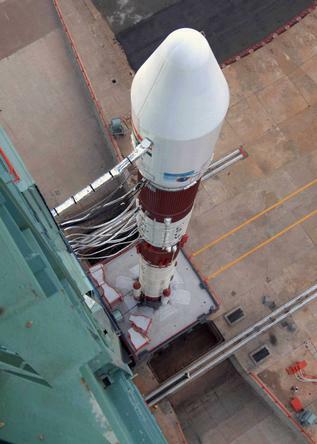 The PSLV-C14 will then stand majestically on its launch pedestal. While the Oceansat-2 weighs 960 kg, four of the nano satellites called Cubesat-1, 2, 3 and 4 weigh one kg each. The remaining two – Rubinsat 9.1 and 9.2 – weigh 8 kg each. The fourth stage of the PSLV-C14 will put all of them in orbit at an altitude of 720 km. Oceansat-2 will fly out first followed by the four Cubesats. The two Rubinsats will remain permanently attached to the rockets’ fourth stage which means that the fourth stage will go into orbit. Oceansat-2 has three payloads – ocean colour monitor (OCM), a scatterometer and a Radio Occultation Sounder for Atmospheric Studies (ROSA) from Italy. These payloads will help in studying oceans’ colour, probing the important role played by the oceans in shaping the earth’s climate/weather, researching the interaction of the oceans with the atmosphere, estimating water vapour content in the atmosphere and so on. The satellite will also help in identifying schools of fish, predicting the onset of monsoons, and monitoring coastal water pollution. The six nano satellites, built by universities in Europe, will test innovative spacecraft technologies. Vice-President Hamid Ansari will witness the launch at Sriharikota. This entry was posted on September 23, 2009 at 3:05 am and filed under SPACE. You can follow any responses to this entry through the RSS feed. You can leave a response, or trackback from your own site.